Love, love this rug set I bought...stylish, modern but soft and interesting. Good quality and colors are muted but vibrant true colors. I'm actually buying a few more of these rugs today!! Safavieh Madison Stella Ogee Curve Ivory / Silver Rug - 6'7" x 9'2"
Give your home an elegant update with this lovely area rug. 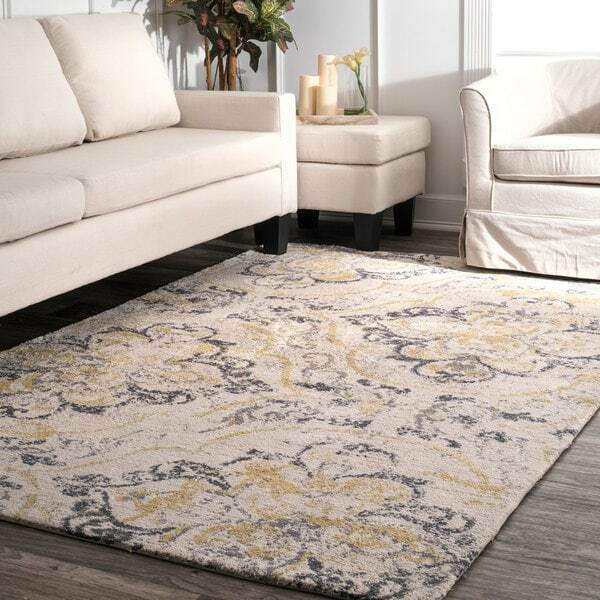 Featuring a distressed abstract floral pattern, the rug complements any decor with vintage appeal and timeless sophistication. I am so excited about this rug. I was a little nervous about the colors since sometimes computers can portray different hues than in person, but the rug looks exactly like the picture! The rug is also incredibly soft- actually the softest rug I have ever felt. This was a great purchase for the price! Very soft. Wish it was a little thicker. Love the color and design. Colors are subtle and blend very well with my color palette. I'll start with the positive: the colors are very neutral and the lighter tones helped brighten up our livingroom. The rug is also soft and lays nicely without needing a rug gripper underneath. Now for the negative: I am quite disappointed with the longterm durability. The fibers mat very quickly, especially in higher traffic areas, and nothing I do helps to fluff them up. I think this would work better for an area with low traffic. I personally would not recommend this rug for that reason, as I don't think buying a new area rug once a year is reasonable. Ordered this rug for my bedroom. The colors are great and the rug feels soft. Took some time to lay flat on the floor, but give it some time. Would highly recommend. 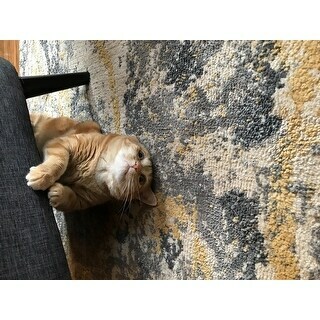 This rug is sturdy and really soft. The gray pattern is a little more obvious than what's shown in the picture, but it's a really nice rug overall. It works well to bring some warmth into my foyer. highly recommend! this rug is pretty and the pattern looks like the picture. However, the colors (blue and yellow) are darker than the picture. It isn't as faded as I thought it would be. I placed the rug semi under my bed, and it looks beautiful. However, it is a little lumpy/bumpy rather than it being flat on the ground. I'm not sure how to solve this problem. It's great but and soft but after a while,the surface of the carpet starts to look kind of pushed down. The first picture is where the carpet is stepped on a lot. The second photo is where the carpet isn't stepped on a lot. I love this rug! It is very soft and perfect in our entryway. The colors and pattern are great at hiding dirt and other things tracked into the house until I have a chance to vacuum. Very happy with this purchase!! I was obsessed with the pattern of this rug. It's simple, yet fun. The pop of yellow is beautiful. I've had it for only three months and it is so worn! It is in a high traffic area, but just bummed that it won't last much longer. When we bought it, it was super soft. Totally worth it if it's in a bedroom, or area you aren't constantly in. Otherwise, it won't hold up. Colors totally complimented our décor, but it is THIN. Had to buy a matt for under it because sitting on the carpet alone was painful atop our wood floors. Not a forever rug, but will do for now. Softest rug ever. True to picture. Purchased this rug almost 3 years ago and it has withstood the test of time. It was much thinner than I expected (very thin) but extremely soft. I really like this rug. My only Con is it is a thin rug. Super super super soft, Give him my cat liked it. Love the look of it and it is soft on the feet. The only downside is the rug is thin and the vacuuming is difficult. Very soft rug and beautiful pattern. I have 3 kids and this rug cleans up pretty well. "The photo looks like gold and grey in the picture. Are those the colors? There isn't any blue in it, correct?" 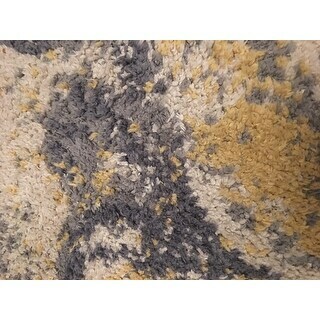 The rug is ivory with shades of yellow and blue. "Is there any blue in this. Someone mentioned that but it looks grey. I'm looking for grey & yellow. Blue would ruin my look I need. Thanks "
There's no blue the colors you see on the web are very accurate to the final print colors. I would however not order this rug again if I had a chance to do it all over. Why? because it quickly loses it's "fluff" or the "soft" that's referenced in the comment below. We haven't had a lot of foot traffic on it and it's already mushed/flattened down - it doesn't have the same feel or appeal as when we ordered it just a few months ago. This is quickly going to need to be replaced. it's a great pattern, but poor material not meant for withstanding any kind of pressure. "can someone please post a pic of the rug. Is there lot of white in the rug? Thanks -suma"
I don't have a pic, but I'd say it's about 30% white. 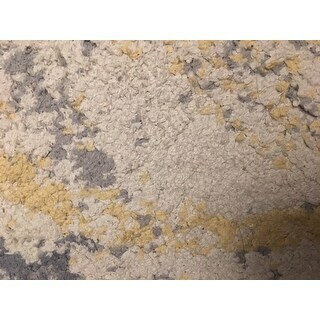 "can someone please confirm if there is "blue" in this rug like it states in the description? all I see is ivory, light and dark gray and a dark yellow!" "It states there is blue coloring in the rug. I don't see any blue. Can someone please confirm if there is, indeed, any blue in this rug!" "Is the background color light ivory?" Yes, it is a light ivory. "Is the grey and gold or blue and yellow?"